The statistical representation below illustrates a comparison between the 2016-2017 and 2017-2018 Academy seasons. 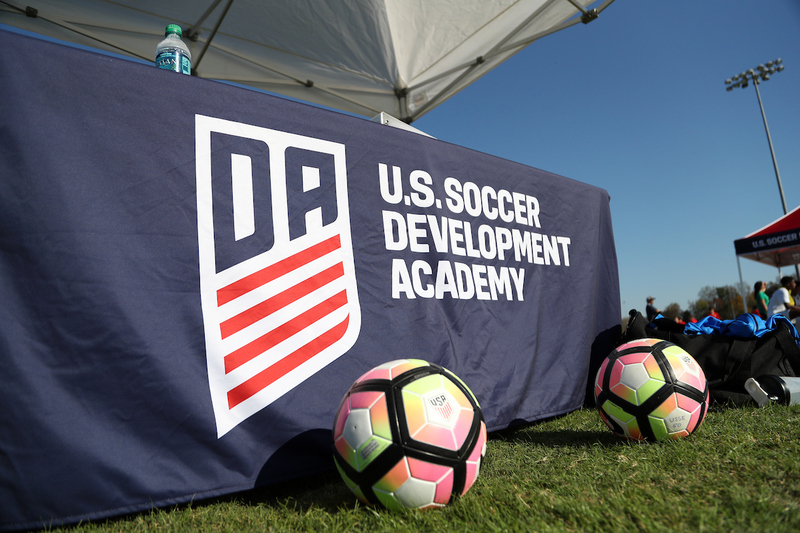 "The Development Academy is extremely excited to announce our second largest expansion to date, welcoming 165 new teams across all of our age groups," Development Academy Director Jared Micklos said. "This expansion is a direct reflection of the commitment from existing Academy clubs and the permeating effect of the Academy influence on additional clubs across the country that are adopting the Academy philosophy. When the Academy added 230 teams for the current 2016-2017 Academy season, our primary objective was to establish a base at the U-12 level. This early success at U-12 has created an opportunity to expand the player pathway, especially at the U-13 and U-14 age groups." At U-11/12, all but one of the 15 teams entering the age group for the 2017-2018 Academy season are new clubs to the Academy. Cincinnati United Premier and San Antonio FC are the only new clubs who have been accepted into multiple age groups along with U-11/12 for their inaugural Academy membership. Both clubs will also field U-13 and U-14 teams in the Mid-America and Frontier divisions, respectively. In total, the 15 additional clubs being added to the U-11/12 2017-2018 Academy season will bring the number of U-11/12 teams to 150. The addition of 27 U-13 and 34 U-14 teams in 2017-2018 is primarily due to the expansion of two new divisions in Oregon and Washington. Combined, these two markets currently have 17 teams participating at U-12. The recent success and player development efforts from the clubs in these markets are the driving forces behind the expansion. This growth expands the player pathway in the Northwest region, which will create additional opportunities for player development. At the U-15 age group, 10 additional clubs have been promoted for 2017-2018, along with the 72 current clubs who received automatic expansion into the U-15 single age group. Greater details of the U-15 expansion were highlighted earlier this month. The U-16/17 age group will see a total of five teams expand into its 2017-2018 divisions. At the U-18/19 level, one MLS Academy club and one full-time residency program headline the expansion effort to 73 teams. New York City FC continues their planned growth and will now field teams at all age groups, and Grande Sports Academy will enter the Development Academy for the first time at the U-15, U-16/17 and U-18/19 age groups. With an eye towards the future of the Development Academy, Director Jared Micklos added, "We look forward to continuing to work collaboratively with existing and new Academy clubs to build a foundation of players that will progress through the Academy pathway as we strive to develop world-class players."